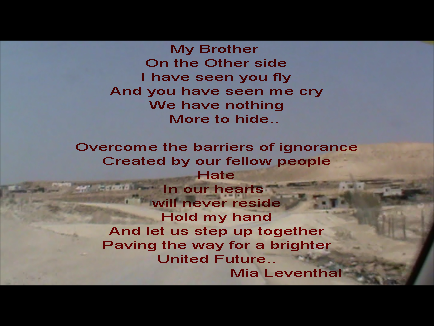 *Image taken from my journey to the West Bank to see My Palestinian Sisters which I work with in Project Aakhda. This entry was posted on January 18, 2015 at 3:58 pm and is filed under Uncategorized with tags brotherly love, carrying message for peace, global love, global peace, love, messages for peace, poetry, poetry for peace, projects for peace. You can follow any responses to this entry through the RSS 2.0 feed. You can leave a response, or trackback from your own site.